Great clips. I would buy these again. 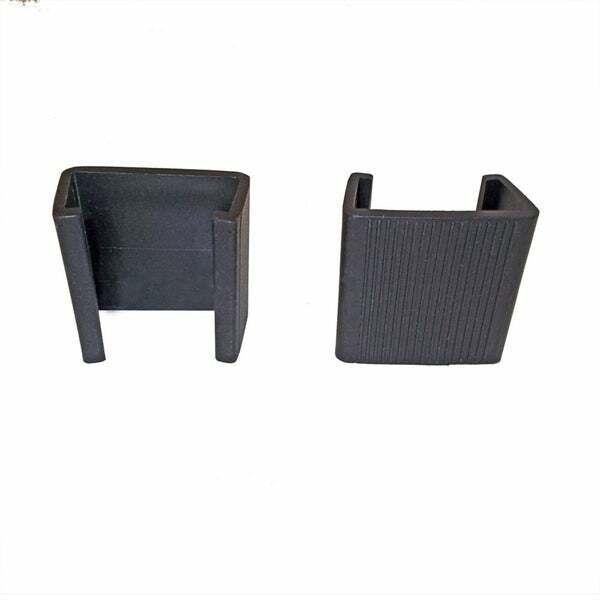 Prevent your wicker furniture from moving with our strong and durable all-weather clips. Fasteners fit all TKC Barbados, Florence, Monterey, Miami, Fairmont, Belle, and Laguna collections. 1 pair of clips required to properly connect 2 pieces. Dimensions 3.0 In. X 3.0 In. X 2.0 In. These clips are awesome. They are easy to use and you receive just enough to put together the Fairmont 7 Piece Outdoor Wicker Patio set. I highly recommend using these clips so the pieces do not slide apart! These clips are amazing. Somewhat easy to put on, except for the middle corners. You have to reach under the small space from frame to ground and try to clip with one hand. Brings the two pieces together so you don't have to worry about the pieces separating when you sit down. Fits snug on the frames. Good quality, seem like they will last a long time. I purchased this set of clips for my new outdoor furniture. I find them to be sturdy and the do a great job at keeping the furniture together. It’s nice that the furniture doesn’t move apart & u don’t have to worry about your pieces shifting out from under you. There a lot of these so I have a few extra. Would recommend. I found that the clips to hold the furniture together are excellent. I found them to be very easy to attach to the furniture and they appear to hold the furniture securely in place. Yes, I would recommend the purchase of the clips to all buyers of the patio furniture! I have had these clips on for about 4 Mos. and they work just perfect! I've had some windy days on my deck but these clips held on and kept my sectional outdoor couch stable, and together. They are easy to put on and very durable. Would buy them again if I needed too. These clips were purchased to add to our furniture set, and they work perfectly to secure the pieces together. The took a tiny bit of effort to use, but clipped onto the bottom of the pieces pretty easily. No brainer about these clips. Easy to install and very durable. They make modular furniture hassle free and keeps the pieces from separating. You really need these if you are purchasing the TK Classics furniture. These clips are a must have and need to be ordered separately. The clips once install (very easy) hold the furniture together and prevents the sections from moving independently. These are very useful for the outdoor furniture set we have. The clips allow us to change the orientation of the furniture when needed. That feature is great for parties and accommodating large groups of people. We ordered these with our large outdoor set and are happy with our purchase. Perfectly fits my Monterey rattain set of furniture. Holds furniture together well. Very happy with purchase. Had a very difficult time clipping them onto the patio furniture - no photos or directions given. Ended up not using them, I'm very lucky that my backyard furniture really didn't need them as they tended not to move a lot. I wouldn't recommend this product. Totally suggest getting the clip if you buy the sectional. These clips were perfect for my new Miami sofa. Keeps the wicker patio furniture from moving when you sit on it, works. Great price. "do these clips work with Monaco Outdoor furniture sets?" "So I have TK Classics Florence outdoor sectional can you tell me how I measure to see if these fit tried to call manufacturer got no good answer or help. " I purchased these clips to use on the outdoor sectional I purchased. They were recommended for purchase to secure furniture pieces together.